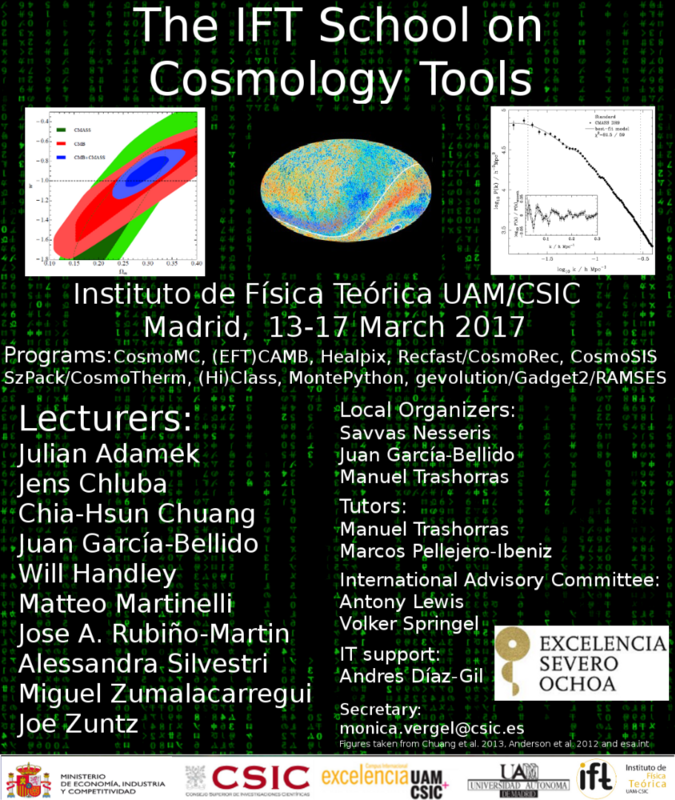 The PhD school on Cosmology Tools will take place at the Institute of Theoretical Physics in Madrid during the week 13-17 March 2017. In this school several renowned experts on the use of cosmology codes will teach the students how to compile, run and modify the codes, answer technical questions and provide feedback on their problems. Also, the school will provide ample time and opportunities for interaction between the students and the more senior people, thus fostering international collaborations and potentially leading to exciting new projects. Many photos of our lecturers and students during the School can be found here. Note: The next "CosmoTools" School in the series, will take place in Aachen on 2018, organized by Prof. Julien Lesgourgues. The exact dates and venue place will be announced soon! Code for Anisotropies in the Microwave Background (CAMB). Effective Field Theory with CAMB (EFTCAMB). Hierarchical Equal Area isoLatitude Pixelization of a sphere (HEALPix). A code to calculate the recombination history of the Universe (Recfast). Fast computation of SZ Signals (SZpack). The Cosmic Linear Anisotropy Solving System (Class). Horndeski in the Cosmic Linear Anisotropy Solving System (Hi-Class). Monte Carlo code for Cosmological Parameter extraction (MontePython). Cosmological parameter estimation tool (CosmoSIS). Cosmological N-body/SPH simulations (Gadget 2), (gevolution), (RAMSES). The registration is currently closed due to the high number of applicants and the accepted MSc/PhD students have already been notified. There are only a limited number of positions, due to limited space and resources, and unfortunately there will be no financial support. To be accepted the students will need to have a demonstrated ability to code (shell, Fortran, C etc), basic knowledge of cosmology and numerical techniques. In some cases, reference letters from their advisor may be requested.